The olive is a versatile fruit tree, producing edible fruit that produces oil for cooking and eating, among various uses. But if you are unable to harvest the fruit from an olive tree, it can create quite a mess as it drops to the ground. Prevent an olive tree from producing fruit by stopping it from flowering. 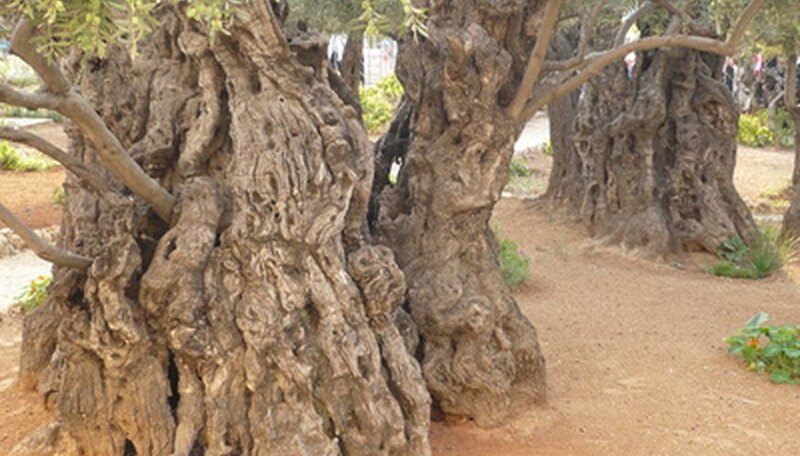 Wrap olive trees in winter. Olive trees will not set buds unless they experience a winter of warm days and cool nights, called vernalization. Most olive trees planted in Texas do not receive the right temperature cycles in winter to produce fruit, but trees in California do. To prevent your tree from experiencing vernalization, wrap it in layers of landscaping tree wrap and burlap in winter. Remove the wrap in spring. Prune olive trees in early summer after the buds set. Olive trees are unique in that they set buds in the spring. Most other fruit trees set buds in the fall. By pruning in spring, you will remove the buds before they can bloom. Apply a fruit-eliminating spray containing ethephon. Sprays with ethephon release a plant hormone called ethylene into your olive tree, which prevents it from flowering. Time your application of fruit eliminator before the olive tree sets buds. Additionally, ethephon works best in spring once temperatures rise above 65 degrees Fahrenheit. Mix fruit eliminator according to the directions on the package. Pour the chemical into a pressurized spray applicator. Prime the applicator by pumping the handle up and down until the pressure builds within the applicator. Grasp the holding tank in one hand and the application wand in the other. Open the application wand’s nozzle and pass the spray applicator over the foliage of the olive tree in broad, even strokes. Always wear protective clothing and breathing protection when applying chemical fruit sprays. Time your application of fruit eliminator for a day that is not windy. This will prevent the chemical from drifting onto other plants, and will maximize the application of the chemical on your olive tree.